Kodachi provides full anonymity with a VPN, TOR Network and even DNS encryption. When you start the Operating System, it automatically changes your MAC Address and starts VPN and TOR Network Service. Then it forces all of your traffic to go through the VPN + TOR Network Tunnel with DNS encryption. It has I2P, GNUNET and custom VPN as alternative options to TOR which other similar Operating systems like Qubes and Tails lack. You can also deploy your own VPN easily using built-in VPN clients. 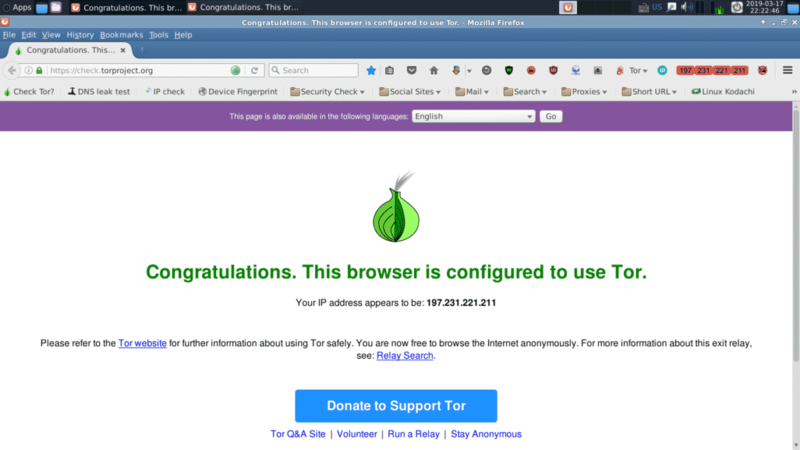 It has dedicate panel for TOR services where you can change your exit node if you want. Kodachi browser has tons of extensions to Block Scripts on your browser, change browser agents, block ads and destroy cookies. These extensions can save you from online tracking, cryptojacking and many other online attacks. If something goes wrong while surfing the web, there is a “Panic Room” folder specially built for emergency situations where you can wipe Hard Disk, RAM and destroy kodachi completely. By using these options, no will be able to trace you back or perform any type of Forensics on host’s system because it will leave no traces on the system even on RAM. Also if you’ve installed Kodachi on your Hard drive and you want a complete re-install with no traces of previous Kodachi, then you can do it within the live session without any extra effort. The built-in tools save all configurations and settings and can resume your working from where you left. Kodachi has pre-installed tools that support both symmetric and asymmetric encryption to secure your files online and offline. VeraCrypt, TrueCrypt and GPA use to encrypt your files, docs, partitions and hard drives while KeePass is used to securely store your passwords. Kodachi OS is very friendly as compared its competitor Operating Systems and requires no prior knowledge to use it. You don’t have to be an IT expert to use Kodachi, softwares, firewalls, VPNs and TOR are pre-configured and put into the folders for your ease of use. It’s gonna take an hour or less for a noob to get completely comfortable with the Operating System environment. Kodachi also has a set of apps that are used for general purposes like Virtualbox, Bleachbit, Audacity, Filezilla and System Monitor that add to its accessibility and ease of use for a normal user. Kodachi is an Operating System built for anonymity and privacy online. Kodachi has got everything that one can need to secure and anonymize himself online. It’s famous for its ease of use, so many built-in tools and features. 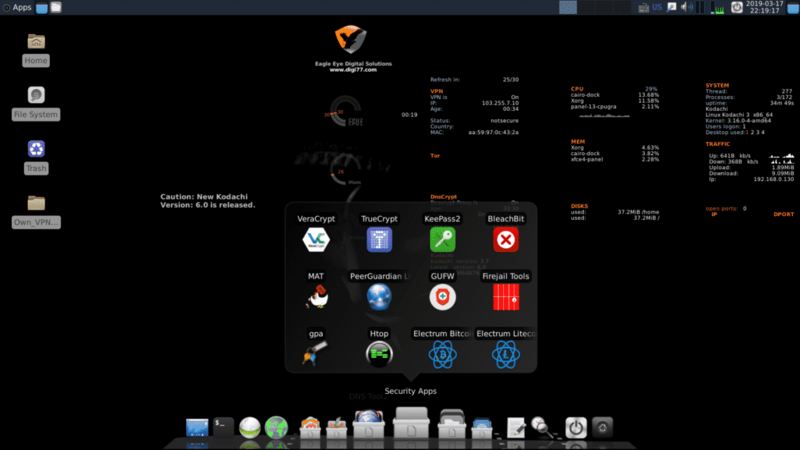 Its Desktop environment is user friendly and light weight. Formerly, Tail or Qubes OS were used for that purpose but when Kodachi came to market, it got much popularity because these OSes don’t have these advanced tools & features.